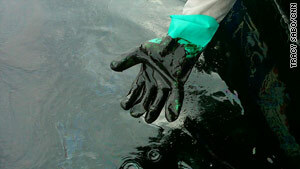 Insurers are adding up the potential cost of BP's oil spill in the Gulf of Mexico as oil continues to pour into the sea. London, England (CNN) -- As the BP oil spill continues to blacken waters in the Gulf of Mexico and beyond, Lloyd's of London has issued its first estimate of net claims from the disaster. The world's largest insurance market says total claims from explosion of the Deepwater Horizon oil rig could be between $300 million and $600 million. The figure was based on information from an unknown number of Lloyd's 78 syndicates with exposure to the disaster, including the limits of their individual contracts. It doesn't include losses outside the Lloyds market or those carried by BP, which was self- insured when the rig exploded on April 20, killing 11 workers and spilling millions of gallons of oil into the sea. On Sunday, BP said to date it had spent around $760 million on its emergency efforts, including the "cost of the spill response, containment, relief well drilling, grants to the Gulf states, claims paid and federal costs." It said it was too early to quantify other potential costs and liabilities associated with the incident. More than 26,000 claims have been filed against the company resulting in payments of more than $36 million, BP said Tuesday, while announcing the appointment of an independent mediator to oversee claims. "We have opened claims offices across the region, and will make every effort to reach everyone who has a legitimate claim," BP Chief Executive Tony Hayward said in a statement. Transocean, the owner of the oil rig, is attempting to limit the exposure of its affiliates to the disaster through the U.S. courts. Several of its affiliates have filed a petition with a Texas court to cap liabilities associated with the oil spill to the value of their interest in the Deepwater Horizon rig. The petition put that value at just under $27 million. In a statement, Transocean said more than 100 lawsuits had been lodged against its affiliates in multiple states and courts. It is seeking to consolidate the lawsuits in a single court before federal judge, and pay out any claims from one dedicated fund. A group of Transocean insurers, including Lloyd's of London syndicates, have made their own filing to a Texas court seeking to clarify the limits of their obligation during BP's clean-up operation. According to court papers seen by CNN, BP provided notice of a claim to Transocean Excess Insurers by e-mail on May 14. In response, the document says the insurers are seeking a judgment declaring "they have no additional insured-obligation to BP with respect to pollution claims against BP for oil emanating from BP's well. It put the maximum liability under policies for covered claims at $700 million. Lloyd's said the losses incurred by its syndicates would have a "negligible" impact on Lloyd's capital. The $600 million maximum estimate pales in comparison to Lloyd's insurance losses in previous years. The combined might of Hurricane Katrina, Rita and Wilma cost the insurance market $5.856 billion in 2005. In 2006, Hurricane Gustav and Ike produced claims worth $2.574 billion. Lloyd's does not compile a list of losses adjusted for inflation. It said it was difficult to provide an accurate estimate of the financial impact of the BP spill while oil continues to leak into the sea.